VC recently caught up with acclaimed American composer Adam Schoenberg following the successful world premiere last week of his new violin concerto ‘Orchard in Fog’ – with violin soloist Anne Akiko Meyers, conductor Sameer Patel and the San Diego Symphony. In a VC-exclusive blog, Adam discusses his inspirations for the new solo work – and the long process of taking it from his head to the concert stage. 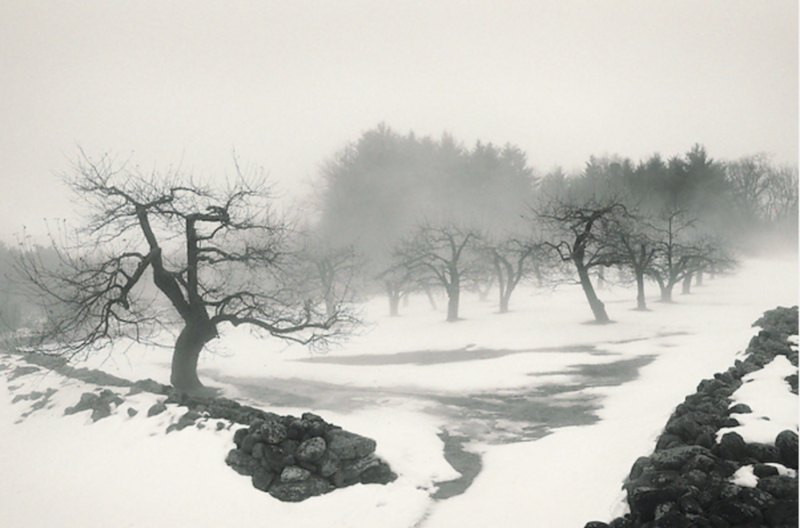 “Orchard in Fog takes its name from a photograph by Adam Laipson of an apple orchard in winter. This particular orchard happens to be the same place where my wife and I were married in my hometown of New Salem, MA. Orchard in Fog tells the story of an aging man visiting the orchard where he was once married many years ago. It is the dead of winter, and he is now weak and tired, and nearing the end of his life. Movement I (Frail) is reflective, and represents the present day. It features a series of melodies that are more melancholic than hopeful. The violin uses a scordatura tuning (G string is tuned down to F for the entire piece), and focus is not only given to the low F, but also the uppermost register of the E string. Movement II (Dancing) is a memory. It captures the old man looking back on his life and all of the beautiful, youthful moments he had with his wife. This is one long dance that is built on a layering technique, where something new happens nearly every eight measures. Movement III (Farewell Song) gradually brings us back to the present day, and to the orchard where the old man’s journey first began. This is his farewell song to his love, and to the life that he has known. It is now time for him to leave everything behind and move into the unknown. It once again takes advantage of the now G-string tuned down to F, as the entire movement is in the key of F. Whereas movement I was more somber in tone, this movement gives us a glimmer of hope and acceptance. Anne Akiko Meyers and I had previously collaborated on an arrangement of When You Wish Upon A Star. She approached me following that project to see if I would be interested in writing her a concerto. I was both humbled and honored and, of course, said yes! A new piece of music always sounds different in your head before coming to life on stage. Part of the beauty and vulnerability of this process is that we (composers) learn to relinquish control and truly let go once we put the final bar down. It has been great collaborating with Anne, Sameer Patel, and the San Diego Symphony. Anne and I first worked out details regarding her specific part and how to make it as memorable and meaningful as possible. I then met with Sameer before the premiere to go over the score and orchestration with him. We then all came together during the rehearsal process, and at that point, I spent the remaining time before the premiere fine-tuning the orchestration and overall balance of the piece. This is an unusual concerto in that it is slow-fast-slow. It is also my most intimate and personal work-to-date, and one that I feel very much connected to. It is heartfelt, emotionally big, and quite lyrical. I hope the listeners enjoy the journey that the piece will take them on.